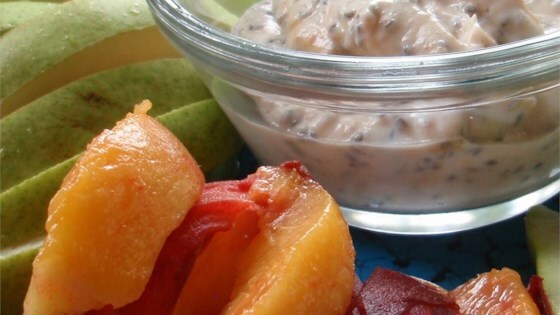 "A healthier, lower-fat and lower-calorie version of peanut butter fruit dip. Great with crisp apples! Use soon after prep, especially if using flax or chia seeds." Mix yogurt, peanut butter, honey, and cinnamon in a bowl until well blended; fold in chia seeds. I loved it.I made it into a salad. I chopped up 3 apples, grated 2 carrots and added unsweetened coconut. My family loved it! Delicious. I used plain Greek yogurt instead of vanilla and didn't add the chia seeds. Still plenty sweet for me. didn't think it sounded that good with yogurt in it, but I loved it with apples! made it in the blender and it was super easy! This recipe was completely awesome. No corrections, perfect as is. the only unfortunately thing i found? impossible to not easy in one sitting.